There is something irresistibly charming about an underwater French explorer wearing a red cap. 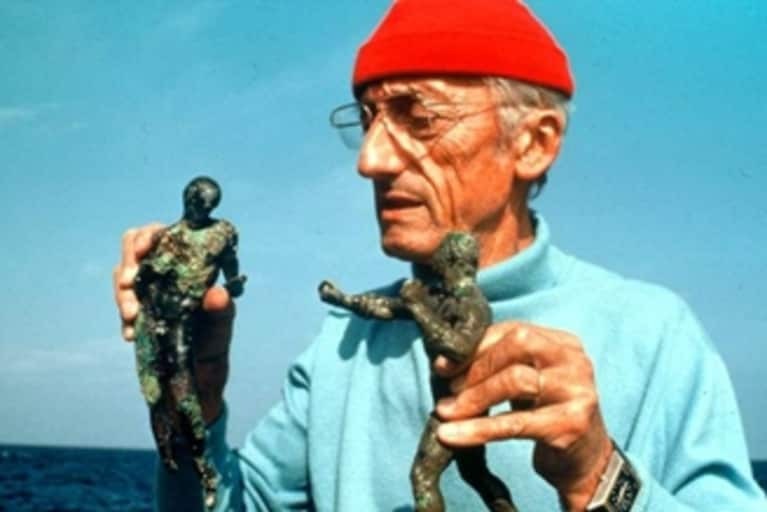 Jacques Cousteau, a filmmaker, author, and inspiration for Wes Anderson’s Steve Zissou, captured the imaginations of young and old alike with his informative and poetic underwater documentaries. No one but the French could so gracefully weave reflection on life into a nature film. Cousteau initially began his career in the military, but while training to become a pilot almost died in a car crash. During his recovery, he began swimming every day in the Mediterranean and was lent a pair of underwater goggles. He was amazed by the oceanic world he could suddenly view with clarity. His pursuit to spend longer and longer amounts of time underwater filming and exploring led to the invention of the first Self-Contained Underwater Breathing Apparatus (SCUBA). Soon after Cousteau leased the Calypso, the ship he would use for the next 4 decades, from a friend a grand total of 1 dollar a year. He outfitted the ship with scientific and film equipment and set sail to capture everything from the world of sunken ships in the Mediterranean to sharks in the Yucatan. Over the course of his life he created over 115 films and books. Although there are a plethora of nature documentaries available, Cousteau’s adventures on the Calypso will always be a favorite. We see the joy Cousteau has in his work, and are compelled to feel childish delight as we walk alongside him on the bottom of the sea. 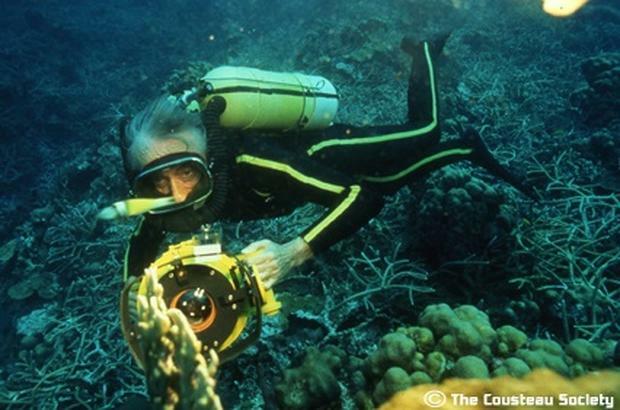 Today, his legacy is continued through the Cousteau Society, an organization that continues to support scientific research and protect the watery parts of our planet. There’s no denying that 35mm film is back. Every tourist destination is adorned with at least one or two film enthusiasts toting a Canon AE 1. 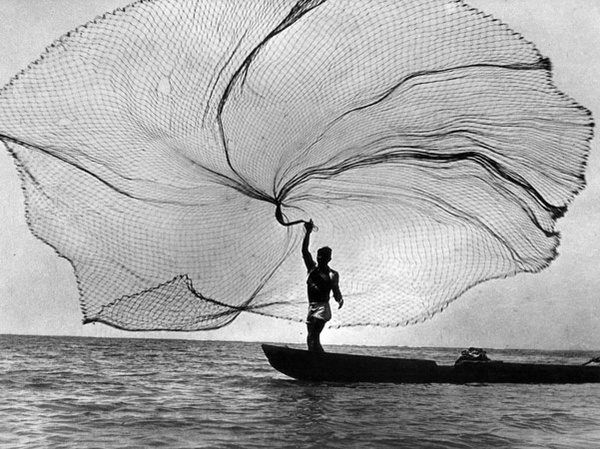 In celebration of the resurgence of film photography, today’s post is about the great and fascinating photographer Henri Cartier-Bresson. Cartier-Bresson grew up with wealthy parents and studied for a year at Cambridge before being conscripted into the army in 1930. He didn’t make it very far before being put under house arrest for hunting without a license. During this time period a friend gave him his first camera. He loved to read and after discovering Joseph Conrad’s Heart of Darkness he decided to go to the Ivory Coast, which was colonized by France at the time. He made a living by hunting and selling game to local villagers. He married a dancer from Java and they lived in a cramped apartment where he set up a dark room in the bathroom. He worked on films with the famous director Jean Renoir and took photographs for a French communist paper. Cartier-Bresson spent most of World War Two in a prisoner of war camp. On his third escape attempt he was successful and joined the underground resistance. He secretly photographed France under German occupation and later made a film about people returning home after its liberation. After the war, he worked with Robert Capa and several other photographers to form Magnum photos, a global photography cooperative. Cartier-Bresson was one of the first people granted access to photograph the Soviet Union. He radically transformed photography and shaped the ideology that still dominates photojournalism today. His book, “The Decisive Moment” emphasized that the photographer must be ready for the right moment, and if it is missed there is no recreating it. Cartier-Bresson’s photographs bring us glimpses of times and places now long gone and remain a priceless way of retelling our history. Last week the world lost the Queen of Soul, Aretha Franklin. Not only was she an unparalleled musician that inspired countless artists, she was a civil rights activist. Her music lifted up countless generations, providing strength and hope to many. Aretha Franklin was the first woman inducted into the Rock and Roll Hall of Fame and performed at the inaugurations of three presidents, including Barack Obama’s. The state of Michigan deemed her voice so special they declared it a “natural resource” in 1985. She began her career as child, singing gospel music in church. As a twelve year old she began performing on “gospel caravan” tours with her father, a preacher. By the age of 19 she recorded “Rock-a Bye Your Baby with a Dixie Melody” which reached the top 40 in the U.S., Canada, and Australia. Her voice had a magical ability to reach down deep into her audience’s soul, to make the listener ascend with her as her voice seemed to reach for the heavens. Her extraordinary talent has been cherished by young and old alike, and is certain to make her revered for a long time to come. There’s primary colors, secondary colors, and tertiary colors. How they mix, the effects that these mixtures create and the study of “color theory” can be traced back to the 15th century. Color theory is considered one of the most basic and important building blocks of artistic practices. 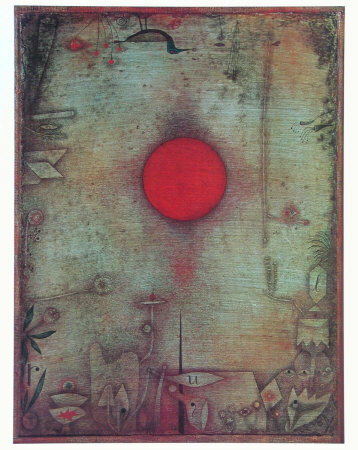 In 1920, while teaching at the Bauhaus, Paul Klee elevated the conversation and study of color theory, arguably creating a whole new appreciation of color that blossomed into art that was ever more abstract. He was, in a word, obsessed with color. Some of his paintings simply consist of varied color blocks. If you look closely though, you can see technical experimentation taking place, this is especially obvious in Ancient Harmony, pictured below. While all his paintings display a masterful understanding of color, some of them also explore images and symbols that seem ancient and mythical. One of my favorite paintings is On the Edge. While abstract art does not usually capture my attention, this particular piece draws you in and holds your gaze. 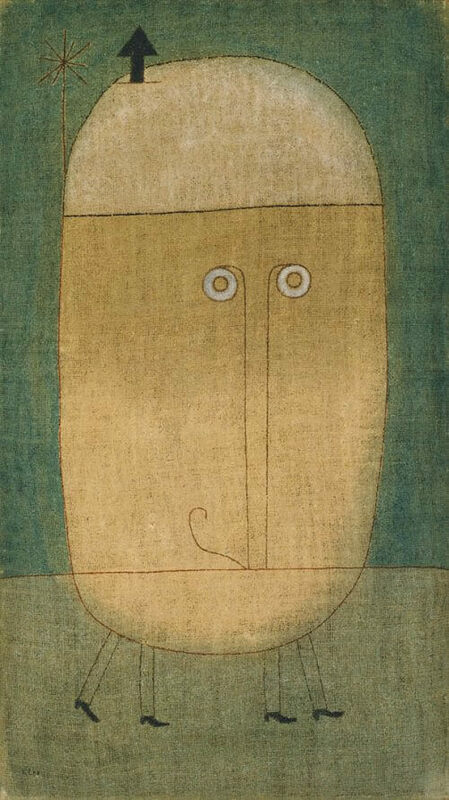 His other paintings like Mask of Fear, depicting small inscrutable faces, just make me laugh. They are so playful and full of childlike wonder it is hard not to smile. “She would not be a madwoman, nor anyone’s beautiful corpse.” That’s how Anwen Crawford of the New Yorker described the subject of today’s post, Leonora Carrington. Carrington was a surrealist artist who spent most of her life in Mexico City. She is best known for being the girlfriend of Max Ernst, but she went on to lead a life that was extraordinary in its own right. In the midst of World War II Ernst was arrested and eventually escaped, leaving Carrington behind. She in turn ran away to Spain, where her family had her institutionalized. After experiencing “treatments” that were more like torture, Carrington wrote one of her first surrealist novel Down Below. After befriending a Mexican Ambassador, she was finally able to move to Mexico, the country that eventually became her home and a lifelong source of inspiration for her fantastical paintings. Both her paintings and writings tried to subvert the female form. Carrington was not content to be a muse. She challenged herself and others throughout her life: from moving to a new country and writing in a language that was not her own to leading the Women’s Liberation Movement in Mexico City. Leonora Carrington truly deserved to be called a hero. Here at Amano Studios we are often inspired by the history and landscape of Northern California. One of the necklaces in our Commune Collection was named after the Morningstar Commune, nestled in our very own Sonoma County hills. It’s taken on a kind of mythical status as one of the many communes that populated the state during the 1960’s. The property belonged to Lou Gottlieb, a hippie and comic-musician-renegade intellectual. He declared it open land, free to all looking to live in harmony and escape from the world. The commune attracted flower children from all over the country making their way to the iconic Haight-Ashbury. Ramon Sender, one of the first residents of Morningstar, said “Lou’s ranch seemed an ideal place to continue my sun yoga.” Amen to that! From growing their own food to wearing natural fibers, the Morningstar crowd were the pioneers of DIY. Natural simplicity and taking joy in objects that could be created by hand spurred us at Amano Studio. Sonoma county is still a refuge for those in need of repose from city life (but there aren’t very many nudists to be found). We like to think that the jewelry in this collection could be worn by the freedom seekers of the sixties or by someone just looking for a weekend escape. Sometimes, you just need to follow the advice of Joni Mitchell and get back the land to set your soul free. Many have tried and failed to imitate the great Joni Mitchell. Determined not to follow the crowd and wary of the crowds that declared her a leader, Joni is one of our favorite heroes. She managed to be simultaneously dreamy in her song lyrics while keeping a sharp eye on reality. The darling of the 70s had considerable disdain for her peers; intentionally missing Woodstock and mocking Bob Dylan’s childishness. Always escaping and eluding the men that loved her, she refused to let her heart or creativity be controlled by anyone. She’s the musician who influenced so many, yet insists that she is actually a painter whose life was derailed. Like so many aspects of her life, Joni’s sense of style seemed to be both a product of her time and mysteriously above it. Vogue described her look as “earth goddess.” With long straight hair, high cheekbones, long flowing dresses and bare feet, Joni has unintentionally caught the eye of many in the fashion world. A velvet turtleneck, a peasant blouse, and a berret are just a few of our favorite looks. At 74 she is still rocking a laid back look, but a little more on the chic side. Just two years ago she was the star of Saint Laurent’s clothing campaign. Her stubbornness and grace is a constant source of inspiration, and as the cold winter months roll on, we plan on keeping warm with a little help from Joni’s songs. When you think art house film, French New Wave (or Nouvelle Vague) is probably the first thing that comes to mind. Like many other modern art movements of the 20th century, the French New Wave was based on ideas. In the 1950’s filmmakers and critics began waging a war against high budget movies that served as little more than attractions for the masses. French New Wave film grew out of the French film magazine Cahiers Du Cinéma. The magazine altered the way people thought and spoke about cinema. It was no longer simply a means of escape; film became a serious artistic endeavor. The Cahiers Du Cinema served as the living, continuously progressing, manifesto for the French New Wave movement. One of the cornerstones of their ‘manifesto’ was the concept of the auteur. It placed greater emphasis on the director as the ultimate creative voice of a film. No two directors of the New Wave are better known than Jean-Luc Godard and François Truffaut. Breathless, directed by Godard, is one of our favorites— complete with gangsters, a love interest, and the beautiful Jean Seberg (a true fashion icon). Today’s post is about one of our favorite writers: Joan Didion. Hauntingly beautiful and frail, Didion made a name for herself by writing about the sixties, California, and Hollywood with razor sharp observation. Slouching Towards Bethlehem, one of her most famous books, describes the lost flower children who flocked to San Francisco in a way that is anything but sympathetic. Pictured gracefully holding a cigarette with a thin arm, Didion has become a strange sort of antidote to idealizations of the past. Stern and distasteful of the famous circles she ran with, her writing mimics the kind of panic and neuroticism that abounded by the time the seventies rolled around the Manson murders had taken place. Her writing can serve as an inspiration to all. Whether you are an introvert trying to hack it in the world of journalism, or an entrepreneur attempting to carve out your corner of the world.